Reusing your old jeans is one way you can recycle and help stop them going to landfill. If you have Made a skirt out of your worn out jeans. then why not turn one of the legs into a bag to match. 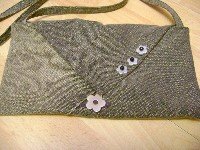 This is one of my favourite ways to make a simple bag, it's just big enough to fit all your essentials in and is mostly lined inside without having to fiddle about cutting patterns out. 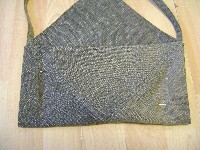 The best bit is that you can add your own embellishments to make it your own unique style. 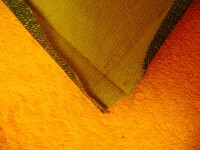 Start off by cutting off the leg and cutting up one of the seams to make a flat piece of material. 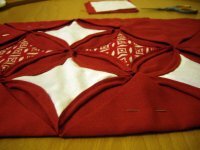 fold it into a triangle edge to edge so that you have a square and cut off the excess. 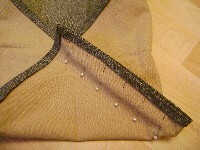 The next step is to hem all the way around. 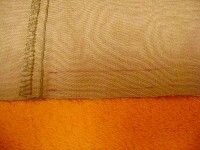 Mark a line 0.5cm in all the way around and then mark another line 2cm in. 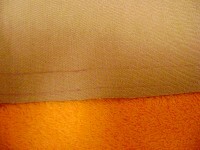 Both measured from the outside edge. 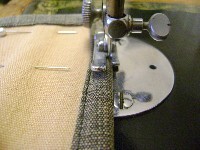 Press the hem over with an iron on the first line. I always use a thin piece of card to help me keep a straight line. Then press it over again on the second line. This is what it should look like when you have finished ironing. 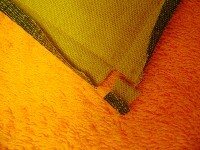 Open out the corner so that you can start to mitre them. this makes them neat and not too bulky. 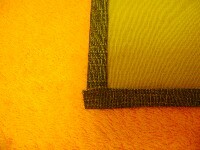 Cut out the little square where the hems cross. Not easy to explain so best to look at the picture carefully. 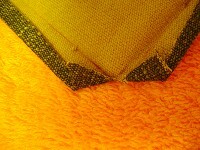 Fold and press the corners as shown, then press the hem back into place. 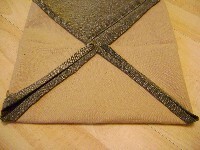 Turn the square right side up and fold all the corners except the top one into the middle. 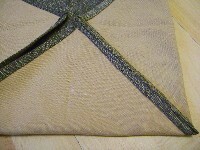 So that there is only a small amount of stitching showing on the outside of the bag we will sew the inside together before sewing it down, Take the sides and pin them together as shown. 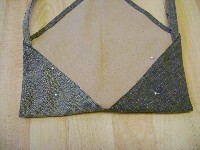 Sew the sides together and repeat on the other side. Iron both sides down flat and then turn to the right side. At this point you need to decide what your bag straps are going to be like. 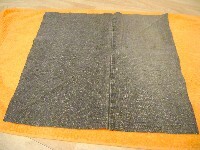 I've made mine from the other leg of the jeans cut up and made into strips. How to make the straps. 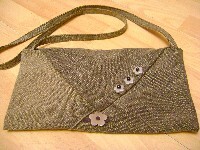 Whatever straps you decide to make push them inside the turned out bag and pin in place. 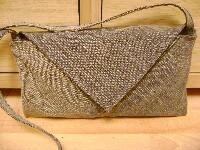 Sewn right through all layers of the bag right from one strap all the way along to the other strap. Make sure to follow the v shape. 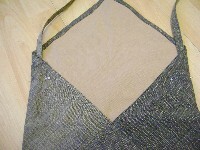 Fold the bag in half right sides together, and pin ready to sew. This is what it looks like from the other side. 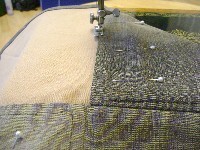 Sew close to the edge on both sides or use a small whip stitch to sew by hand. I like to make things a little bit quirkier by reusing old necklaces and beads that I have taken off clothes and other stuff I throw away. If you have enjoyed this craft why not sign up for our news letter and keep up to date with all the new recycle-crafts news.